'Dutch-style' cycle roundabouts for London tested - basically roundabouts with a segregated roundabout for cyclists all the way around the outside edge. The pictures in the paper have a nice quiet (residential) roundabout with one or two cars going around and oodles of space. Reports are TfL want to (re-)build this as major central London interchange within a confined space. Either it won't work or it won't be what was promised. If the pictures in the paper are the ones that were circulating online today, they were a test at the Road Research Laboratory in Bracknell. The test layout used Dutch road markings - I hope any version used here would use British markings. As I said on the other thread in this forum. In theory it's fine. But it requires all drivers to cooperate and give way to cyclists. Zebra crossings are not popular because drivers don't pay any attention to them. Chris5156 wrote: The test layout used Dutch road markings - I hope any version used here would use British markings. The example on this site is, er, close (if you ignore those god-awful arrows as well as some other bits). Evidently, a wider circulatory plus spiralisation = 'turbo'. Yes and no. I can see a case for using different markings to the standard British design to highlight that it is a different setup. The initial tests are with Dutch markings, as the trial continues UK markings will be tested. The trials will continue to July. More information can be found on the TRL website. But are we yet again a day late and a dollar short? That is not my experience. Whenever I have used one as a pedestrian compliance has been very good. Even where pedestrians lack the confidence to use them correctly, folks are pretty good at giving way anyway. We won't know how an arrangement like that works until it is trialed in a real world application, until then we should keep an open mind. Zebras work very well in my experience, too well sometimes as you often get cars stopping when they don't have to as a pedestrian is approaching the crossing. The turbo-bit is especially designed for dutch car drivers who can't use a multi-lane roundabout as is almost universal in the UK. They have to be guided toward the direction by lane markings which aren't forgiving for drive over. The priority for cyclist on roundabout is a hot topic in the Netherlands. Statistics showed very high accident-rate on this kind of roundabout, 60 to 70 percent higher than on roundabouts with the same layout but without the priority for the cyclers. This is because of the double action of drivers, they have to(in extreme cases) give priority three times. And there can bea cyclist from both ways. Drivers will sometimes miss a cyclist and hit them. I've seen it happen in more than one occasion. I am trying to find a google maps of view example, but my computer on this location doesn't help much. I think zebra crossings work well in slow relatively narrow urban locations. 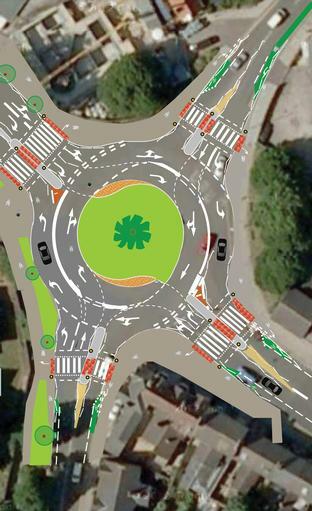 The trend, certainly in NI, has been to replace suburban cross roads with roundabouts with zebra crossings all round them. I used to live near such an example, it was a busy roundabout, and in the first years of opening there were multiple pedestrian knock downs on the crossing. Too busy, such as between pedestrian precincts on High Street in Belfast, and traffic (buses and illegal traffic in this case) tends to get a little agressive and push forward. Too wide and fast, such as the zebra crossing installed on Queens Road Belfast for the Game of Thrones studio (technically a 30mph, but Clearway scrap lorries and Belfast Audi test drives use the runway-like road as a drag strip) and more vehicles tend to ignore. koppie wrote: And there can bea cyclist from both ways. It was my understanding that cyclists would be required to negotiate the roundabout clockwise only? This is a very poor layout for a whole range of reasons. The Give Way position for the cycle track blocks the pedestrian crossing. The sight lines for drivers exiting the roundabout of cyclists coming round from behind and to the left are desperately poor, and for HGV drivers may be non-existent. This was the No 1 issue at the Bow roundabout in East London, which has had multiple cycle fatalities, that drivers turning left had poor visibility of cyclists coming up fast on the nearside and heading straight on (it was initially overcome by a separate cycle phase, but there was of course universal violation of the cycle signal when red). The cycle track with priority would seem to encourage the Lycra Louts to circulate at maximum speed as if on the Tour de France, and come into conflict with exiting vehicles before they can even see them. What we need is sensible and appropriate cycle provision, given that the world is not divided into car-users and cycle-users, many/most of us are both. This roundabout doesn't pass any sensible test. Regarding zebra crossings, I use these extensively, including the many in inner London, and find all across the UK pretty-universal compliance by vehicles. Stories of them being usually ignored are just urban legend. That seems indeed the case, I couldn't make it out completely on the small design. Still, watching your left back from a HGV is a big problem. Doesn't always guarantee compliance by the riders. Chris5156 wrote: If the pictures in the paper are the ones that were circulating online today, they were a test at the Road Research Laboratory in Bracknell. Presumably the ones shown in this article. I can't see the zebra crossings happening at a busy British junction, though. Are Dutch cyclists better disciplined that those in the UK who seem to have no respect for any rules, regulations, laws or other road / pavement users? Welcome on the continent! It's a complete carbon copy of a Dutch roundabout, which works in rather quiet area's, but on busy roads they can be quite a problem for flow of traffic, because you have to wait for a line of school-cyclists. i can't see that being obeyed. Cyclists don't seem to have enough brain cells to work out the meanings of a red traffic light, a sign saying "cyclists give priority to pedestrians" or why they shouldn't undertake a truck turning left! this always sums up the attitude of most cyclists in this country.